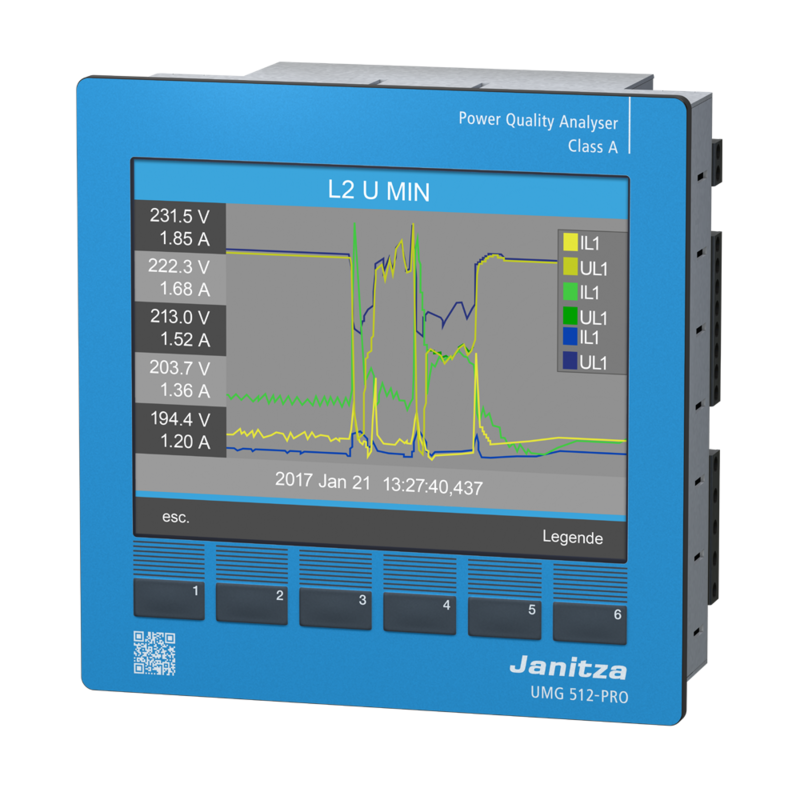 The Janitza UMG 512-PRO is particularly well suited to the monitoring of power quality in accordance with current standards, e.g. 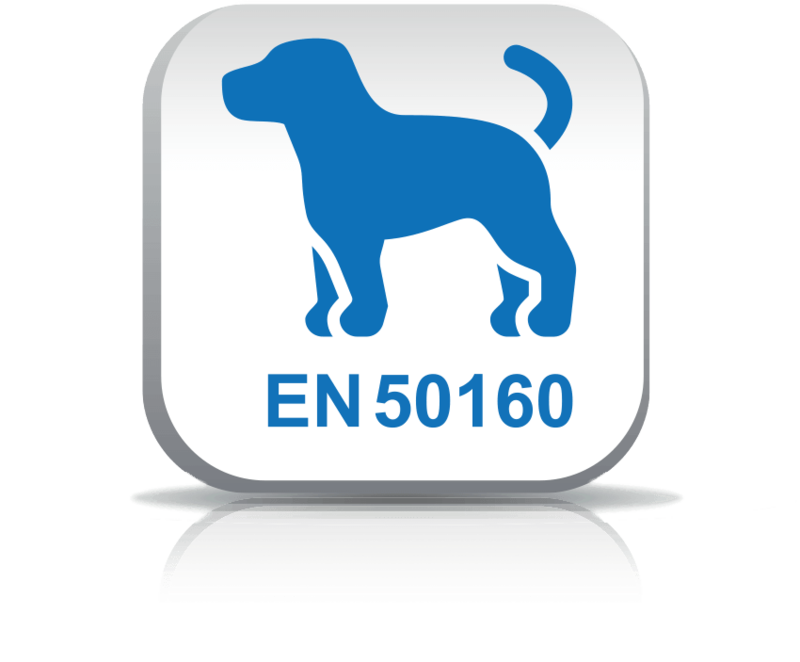 EN 50160, IEEE519 or EN 61000-2-4. Measuring devices in class A are certified to the IEC 61000-4-30 standard. It provides detailed specifications that a mains analyser must meet so that the results can also be consulted in case of disputes. The standard defines the necessary parameters, suitable measurement methods, accuracy and bandwidths. This makes it possible to easily reproduce and compare results. Reliable operation of modern plants and systems always demands a high degree of supply reliability and good power quality. UMG measuring devices reliably record, analyse and document all interferences such as harmonics, unbalance, transients, voltage dips, voltage swells, flickers, phase shifts and reactive power. Powerful RCM residual current monitoring already detects leakage currents in their initial stages before they cause system failures or even fires. It is already integrated in certain UMG measuring devices. The measuring current transformer that is required can be installed manually at a later date if required. Continuous RCM monitoring increases the system safety and availability significantly. In specific applications such as the data centre, residual current monitoring is essential due to the high availability requirements. The web server for the measuring device provides a wide range of data in a user-friendly format. The user does not have to install any software on their PC; a conventional web browser is all that is required. The user enters the measuring device IP address in the browser's URL bar and the measuring devices homepage is displayed on the screen. In addition to the modern homepage, APPs are available for an extended range of functions. The Ethernet Modbus gateway can be used to easily include the Modbus RTU devices that are connected to the master device as slaves in an Ethernet architecture. This is also possible via a Modbus RTU interface for devices with identical file formats and matching function codes. BACnet is one of the most important communication standards for building technology, mainly due to its compatibility with the most diverse hardware and its uniform communication with devices from various manufacturers. As soon as a UMG measuring device has received its BACnet ID and is integrated into the network, the system recognises it and displays it in the browser. This makes configuration very easy. Configurable display of current and historical measured values with automatic scaling. Graphical representation on the device's own homepage without additional software installation. Permanent monitoring of the power quality per EN 50160 in energy supply networks. Permanent monitoring of the power quality per EC 61000-2-4 in customers' energy supply networks. The new PRO series combines the latest technology with excellent functions and attractive design. The increased variety of functions and comprehensive illustration options enable measurement data and measurement results to be analysed and interpreted more easily. 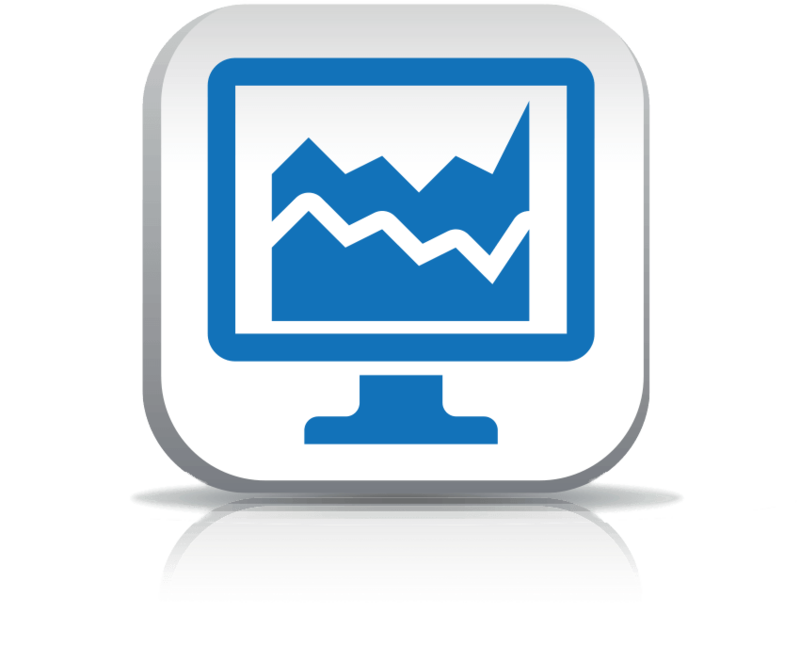 Data can be processed, visualised and analysed with the help of the pre-installed Janitza APPs. APPs are a function extension of the device homepage. The traffic-light principle makes complex power quality analyses, for example, understandable for everyone. 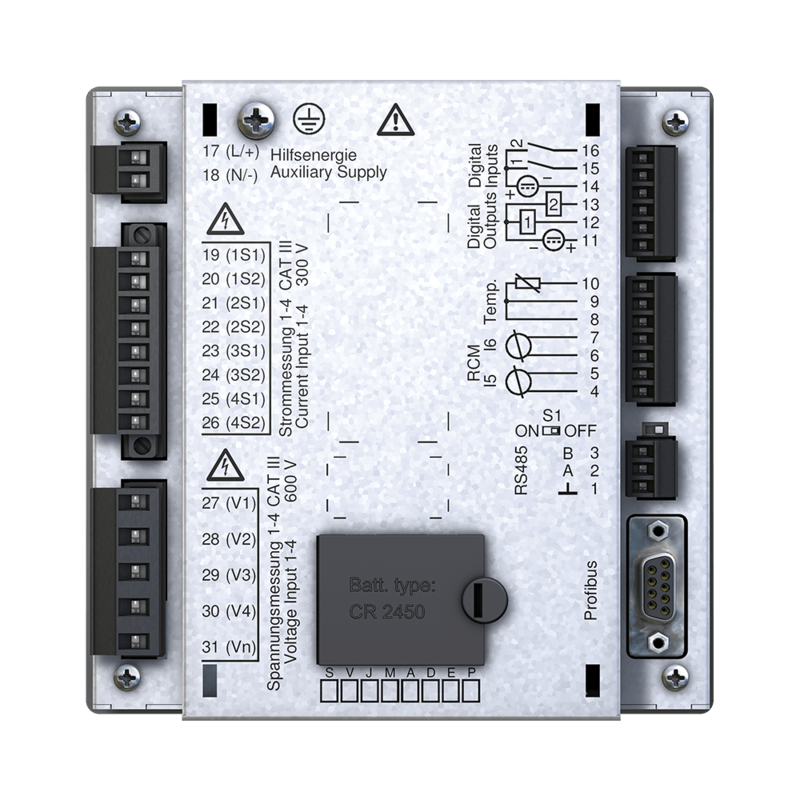 Products for energy and power quality measurement Janitza Electronics® offers you a complete range of power monitoring units with the corresponding accessories. These equipments and power analysers help you gain a comprehensive overview of your energy supplies and introduce the correct measures. The power quality is also monitored according to the general valid standards (e.g. EN50160). Software and IT solutions In the field of energy management, the processing and analysis of energy data and measurement data for electrical power quality is the main focus. All important measurement data should be able to be documented without any interruptions in order to be able to find reasons for production breakdowns, manufacturing problems or quality defects. Products for industrial data communication The respective communication systems are necessary for the development of extensive energy management systems. Janitza electronics® offers a wide range of field bus components such as converters and repeaters etc. Stromwandler, Spannungswandler und Sensoren Obviously currents of several hundreds to thousands of Ampere cannot be directly digitally measured. Current transformers convert almost any amount of primary current into “bite-sized” secondary currents. Power factor correction (PFC) and harmonics filter In electrical power networks, ranging from the industrial electricity network through to office buildings, system perturbation occur when operating electrical and electronic loads. We refer to network perturbation when the original “clean” sinus shapes of the voltage or current changes. Power factor correction spare parts and accessories Wir bieten ab Lager eine umfassende Auswahl an Ersatzteilen, wie Kondensatoren, Filterkreisdrosseln, Thyristorschalter für die dynamische BLK bis hin zu Sicherungseinsätzen. Monitoring systems for distribution networks Secondary substations are increasingly becoming intelligent crosspoints: They take on tasks from simple reading, fault location, interference detection and power quality analysis to complete remote control or even automation. Services After we have developed your technical solution, executed it and commissioned it, we continue to support you further: Training of your personnel, maintenance and support of the systems, regular training for safe handling of energy management, power quality and our products and system solutions, on-site power analysis of existing systems. Applications, case studies and reference projects Application notes with know how about the topics energy measurement, power quality, power management and power quality solutions. Reference projects and case studies Janitza electronics GmbH offers a collection of know-how based application notes with focus on power quality monitoring, power management and power quality solutions. Furthermore case studies and reference projects will be discussed in the application notes. Quick-help Our first place for the most support questions. A large database with frequently asked questions and all contacts of our support team are at your fingertips. Product brochures and information material Do you need additional information about our products? Do you want to order a product brochure? No problem! Help with GridVis® Do you need help with our software GridVis®? Everything you need at a glance. Future and tradition – made in Germany In the Hessian city of Lahnau between Wetzlar and Gießen we manufacture products that are always a little ahead of their time. For more than half a century now. Learn more about our history and products. Product portfolio and complete solutions Complete solutions for EnMS and PQMS from Janitza. Quality management and certification Quality is for Janitza electronics a benchmark which clearly tells how far our products, solutions and services fulfil our customer requirements. Whether these requirements target technical features, reliability, user friendliness or the product price is of no matter. The four fundaments of our quality strategy are product-, personal-, solution - and process-quality. Our ultimate ambition in this process is highest possible customer satisfaction with cost optimized processes. © 2010 - 2019 Janitza electronics GmbH. All rights reserved. To optimize our services and offers we would like to ask you just one simple question. It's completely anonymous and takes less than a minute to answer. We'll be able to improve our services and offers upon your answers. Do you want to return to our survey later?